When, in early 2006, I told my best friend that I had progressed from benign MGUS to the, er, less benign condition of SMM, or smoldering myeloma, she didn’t look shocked or tell me she was sorry or burst into tears (all of which I deeply appreciated!). It’s not that she didn’t care, of course. She is just a no-nonsense, positive-thinking person. And she almost immediately remarked, “You know, I think A. has something like that, too.” “Really?,” I answered, surprised. A few years ago, A. had breast cancer and went through a number of chemo treatments, which didn’t, however, have any negative effect on her MGUS. Her numbers remained stable. And I am happy to report that I saw her test results last spring: they were excellent. In fact, her numbers place her in the MGUS, not SMM, category. Another reason for today’s post is that I have had a few exchanges with a young woman who has recently been diagnosed with MGUS and is very VERY scared. She always gets severe panic attacks and even colic pains before going to the lab to have routine blood tests done. Oh, and sleepless nights, too. I have tried to be as reassuring as possible. But this morning I realized that, instead of reminding her of all the favourable statistics (= only a very small percentage of MGUS folks will progress to active myeloma, blablabla), perhaps the very best thing I could do for her and others would be to provide a few more details about A. After all, A. is not a number. She is not a statistic. She is a real, living and verrry active, wonderful person. And she has become a dear friend of mine (one of my close, card-playing, laughing buddies, in fact). Yesterday, as I was going through my Science Daily newsletters, I found an article on the effect that EZH2 has on ovarian cancer cells (do you remember the Polyhooligans? Yep, EZH2 is one of those pesky Polycomb repressor genes that I began calling “Polyhooligans.” To brush up on your PcGs, look over on the right and scroll down to my Page titled “Myeloma and Polycomb repressor genes”). But this new study tells us that EZH2 will not stop at trashing the inside of your house. No. He will trash the outside, too…by pushing the lawn mower all over your lovely flowers and healthful vegetables and spraying toxic pesticides in every direction. 😉 Okay, so I got a wee bit carried away, there. Point is: EZH2 is bad news! Advanced cancer patients with high levels of EZH2 fare worse than those with lower levels of this evil protein. Hey, there’s a cat in the tub! 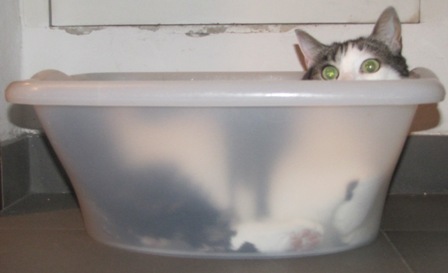 Puzzola, my eldest kitty (nine years old), has always loved stuffing herself into small boxes, the smaller the better…or into laundry tubs…such as this one. She has never minded the, er, overhang. This morning I received a message from Vittorio, the president of the Associazione Schirinzi A. Mario Onlus, reminding me that there is going to be a myeloma patient and family seminar in Pisa on September 12th. I will not be attending, since I will be in the U.S. at that time (a quick two-week trip to Massachusetts, for family reasons). I would like, however, to attend the seminar that will be held in Bologna in mid October (http://tinyurl.com/2vgnqfl). If possible. 14:15 Terapie innovative nella cura del mieloma multiplo. Dr. Brian Durie, Cedars Sinai Hospital, Los Angeles U.S.A. I did a textual search for “myeloma,” but found nothing. This is very odd, since CLL and AML are both mentioned AND there are studies showing that myeloma patients with vitamin D deficiency have worse outcomes (see my Page on this topic: http://margaret.healthblogs.org/life-with-myeloma/what-is-multiple-myeloma/myeloma-and-vitamin-d/). I might try writing to the authors, actually. What was supposed to be a quick and easy post turned into a big hairy monster. It all began a few weeks ago (gollywolly, time flies, doesn’t it??? Well, it’s been a busy summer…), when a blog reader/Facebook friend told our Facebook multiple myeloma support group about a rather alarming article (see: http://tinyurl.com/2wrdqqc). In a nutshell, a newly published study shows for the first time that, while pancreatic cancer cells greedily gobble up glucose, they use fructose to divide and proliferate…Eeeek! Fructose? Wait a second. Isn’t that the sugar contained in fruit?!!! I have been checking my blogging friend Lucie’s blog (http://greenbananascancerblog.blogspot.com/) every day, hoping for a bit of good news. Unfortunately, there has been none. And the dreaded day has finally come. She died in her sleep last night…Lucie had pancreatic cancer. On Monday afternoon, after learning that she had taken a turn for the worse, I decided to sit down and read as many of her posts as I could. And, oh, I found some marvelous ones. Internet has been coming and going today. We are changing providers, which is not as simple as it may sound. As a result, I haven’t been able to do much research (but tomorrow is…another day! ), so today I will simply post the link to the new Simon’s cat video, titled “Simon’s cat in the box”: http://tinyurl.com/28nf2sc Adorable. I lovvvvved it! Oh, by the way, don’t forget to vote for the Myeloma Survivor race car design: http://tinyurl.com/27u2kk9. The word has indeed spread like wildfire, and today we are up to 616 votes (as of 8:24 PM, Italian time). Excellent. Don’t forget that you can vote again and again and again…every 24 hours, that is. So, if 616 people vote again tomorrow, then again the day after, then…well, you get my point! So, click click click! Thanks to a blog reader and to my blogging friend Beth (http://tinyurl.com/275cf5c), I found out that the International Myeloma Foundation has entered a Toyota racecar design in a contest called Sponsafier. The winning entry will be built as a full sized car, and your votes can help push myeloma awareness across the finish line. You can vote for this car design every 24 hours (=not just once, that is). When I voted, just a little while ago, the Myeloma model had received only 203 votes. That’s terrible! So, c’mon, everyone, let’s get our friends, neighbors and family members to vote. Please post this link everywhere possible–your own blog, myeloma patient forums, Facebook, Twitter, MySpace, YourSpace, WhereverSpace, Whoevertwits and Whateverbook–in order to get as many votes out there as possible! Spread the word! Gee, we can do better than 203 votes! I guess you could say that these are “Science Daily days.” During house cleaning breaks, in fact, instead of working on my drafts (! ), I have been looking through some recent Science Daily issues and finding some really interesting reports. Since my time is limited these days, it is a huge relief to have SD do most of the work for me. This SD article (http://tinyurl.com/33owjjm) reports on how vitamin B3 may be an excellent antifungal treatment. It reminded me of a very bad year (for me): 2005. That is when I found out that my MGUS had progressed to SMM, based on the results of a bone marrow biopsy I had in November: 50% neoplastic cells were found in my bone marrow, a percentage that in 2007, after one year on curcumin, had decreased to less than 40% (but, of course, myeloma cells tend to clump together; therefore, bone marrow biopsies, or BMBs, are not incredibly accurate or reliable tests…).